Tanners Hereford has a rich heritage running to nearly 200 years of trading in the city. Our house gin - Tanners Hereford Finest Dry Gin - is a reminder of its many years as William Pulling & Co and is one of the branch’s best-selling lines. All Tanners inexpensive and mid-range wines are stocked together with a very large range of fine and rare wines, plus your other drinks requirements. Neil Clarke, Manager, would be delighted to welcome you. From the Blue School Street ring road, take the Union Street turn signed ‘City Centre - East’. Go into Saint Peter’s Square and you will see Tanners in front of you. You can pick up in the loading area outside or there is normally on-street parking along Saint Owen’s Street. Gaol Street public car park is nearby. For detailed directions to our Hereford Shop, enter your starting postcode below. Neil originally studied Hotel Management and spent many years as a Restaurateur, even once waiting on Prince Charles, before he joined Tanners in 1998. 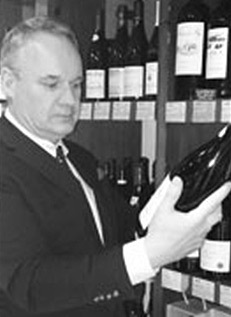 Neil thoroughly enjoys working in the wine trade as it's combined some of his greatest passions: meeting all sorts of people, trialling a diverse range of great food matches and enjoying fine wine. Neil's idea of a really special treat is lobster served up with a delicious premier cru Puligny Montrachet. Although he's enjoyed the experience of travelling extensively through the wine regions of France, Spain, Germany and Italy, a lifelong ambition is to one day actually work with wine in France or Italy.